University of Chicago Medicine is revealing a new name and rebranding a community hospital it acquired last year, reflecting the South Side academic medical center's evolution into a health system. The four-hospital system, one of the most prominent and research-focused in the region, is now called UChicago Medicine. Ingalls Memorial Hospital in south suburban Harvey will transition to UChicago Medicine Ingalls Memorial, while that hospital's five outpatient sites will drop the Ingalls label and adopt the Hyde Park system's new name. 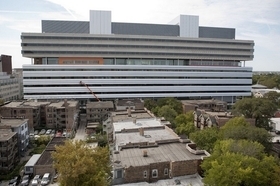 "UChicago Medicine is now much more than an academic medical center in Hyde Park, and the time is right for us to show that transformation through our logo and a broadened brand promise of being at the forefront of medicine, science and education," Dr. Kenneth Polonsky, executive vice president of medical affairs for the university, said in a statement. "We now can provide a continuum of services in which academic medicine powers community care, fueled by our clinical excellence, research breakthroughs and teaching mission." Besides hospitals, UChicago Medicine includes the Pritzker School of Medicine and the Biological Sciences Division at the university. Among other changes, Polonsky and Sharon O'Keefe, president of the University of Chicago Medical Center, will have new titles beginning Oct. 1. Polonsky will take on the new role of president of the health system and executive vice president for biology and medicine. O'Keefe will add chief operating officer of the health system. While many large hospital systems have been busy wooing smaller suitors to join their networks, UChicago has mainly expanded its reach through less formal affiliations. Its partners include Silver Cross Hospital in southwest suburban New Lenox, Edward-Elmhurst Health in west suburban Naperville and Little Company of Mary Hospital & Health Care Centers in south suburban Evergreen Park. The affiliations help the community hospitals gain the branding power of UChicago and expertise of its specialists without having to merge. For UChicago the partnerships expand its care and reputation beyond the South Side and provide a steady stream of patients to its Hyde Park campus when they need a higher level of treatment. Ingalls was the first full merger for UChicago. Since their union in October 2016, they've been working on how patients flow between both campuses. From October 2016 to May, for example, UChicago referred 476 patients to Ingalls for rehab, home care and other services, while Ingalls sent 464 people to UChicago. UChicago orthopedic surgeons are starting to see patients on the Ingalls campus, with ophthalmologists likely to follow soon. In an interview, O'Keefe said the new branding and freshened up logo (featuring a larger university shield and phoenix) in a way is catching up with the system's expansion in recent years. That includes new outpatient clinics in Orland Park and the South Loop. "We hope that we're going to continue to expand services to serve a growing number of patients over a broader geography," O'Keefe said. "Meet UChicago Medicine: A growing medical giant rebrands" originally appeared in Crain's Chicago Business.